Since its inception, Emirates logistics has valued the significance of agent network and have invested in the development and structuring of agents world over. Today we have covered 123 countries and set up an ever- increasing base of over 262 agents worldwide. With our mission of being a global player and become competent to cater to diverse client requirements, we are constantly energizing our global network both in terms of coverage and capability. Group network Emirates Logistics, being part of the venerable Sharaf Group of companies, have had the advantage of our group company’s network, especially in Middle East and Africa. We cover the below countries with our group offices. 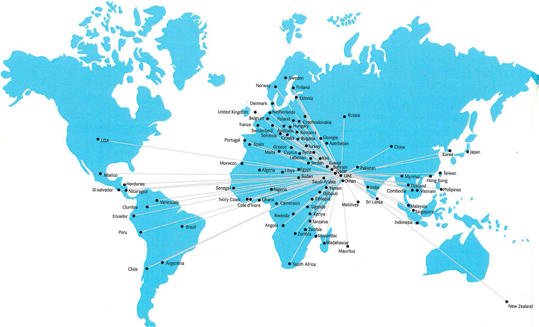 Own Entities: Our own offices and setup in India, Pakistan and Egypt strengthen our network in south east countries.